In The Hospital, There's No Such Thing As A Lesbian Knee : Shots - Health News People in the LGBT community often have a hard time getting appropriate health care. But the problems aren't unique to them. Doesn't everyone want to have a doctor call them by their preferred name? When my partner Cheryl was dying from respiratory complications related to treatment for Hodgkin's lymphoma, she was in so much physical distress she couldn't bear to be touched. The only contact she could stand — one of the few ways I could share my love with her — was for me to rub her feet. As I stood at the foot of her hospital bed doing just that, a scrub-clad figure we had never seen before poked her head in the door, curled her lip and demanded: "What is your relationship?" The question was clearly directed at me, but my girlfriend reached through her drug-induced, hypoxic haze to respond with her New Yorker tough-girl attitude: "Really? Whose feet do you rub like this? What the hell are you, the relationship police?" The Scrub Clad Phantom scampered away and we never saw her again. Although a curled lip seems to be the universal sign for "You disgust me," we weren't at all sure that the question was motivated by homophobia. Although a curled lip seems to be the universal sign for "You disgust me," we weren't at all sure that the question was motivated by homophobia. Scrub-clad figures poking their heads into hospital rooms and asking random questions without so much as a word of introduction isn't a problem just for people in the LGBT community. If you've been hospitalized, you've probably had a similar experience. A friend's butch lesbian partner was so traumatized by past gynecological care she refused pap exams for 25 years and was diagnosed with cervical cancer in the emergency room, much too late for treatment. A trans woman left behind her family in the rural South and moved to Boston where she thought HIV/AIDS care would be more accessible, only to have each clinic visit prefaced with "Are you sure you're not using crystal meth?" This was from allegedly trans-sensitive providers who saw the face of an HIV-positive trans woman and automatically assumed substance abuse. 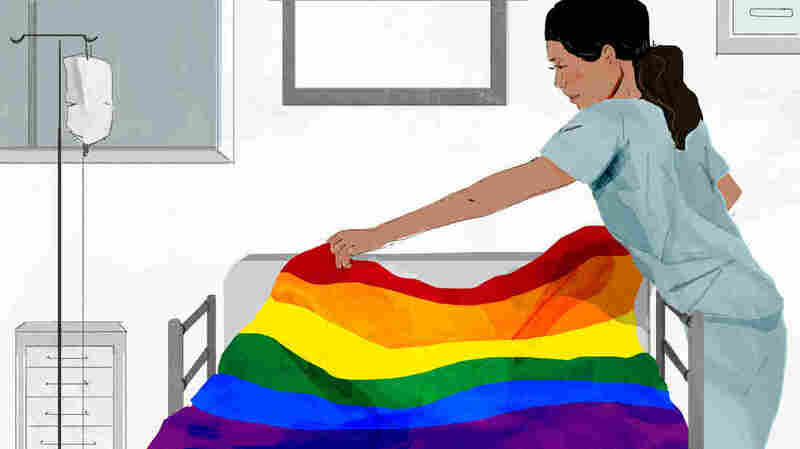 A woman from my queer widow support group was refused entrance to her dying partner's hospital room. A trans man of color who had persistent and dangerously heavy vaginal bleeding for months had to jump through hoop after hoop to receive appropriate care; medical professionals accused him of exaggerating his condition to get insurance to cover transition-related surgery. Other professionals said there was nothing to worry about because "women of color often have unusual periods." He was later diagnosed with stage II uterine cancer. It's possible that because I was the caregiver to two partners who died of cancer (I know, I know; don't stand next to me in a lightning storm) and because I am a nurse in our very underserved communities I am exposed to more of these types of stories than the average person. But even though the federal government just recently admitted "oops, yeah, we should have been keeping data on you people," we do know that significant health disparities exist: lesbian and bisexual women are less able to get health care due to cost; gay men, especially gay men of color, are still disproportionately at risk of HIV/AIDS. Bisexual women have lower rates of appropriate breast cancer screening and cervical cancer screening than straight women or lesbians. In a recent study from Massachusetts, one in five transgender/gender non-conforming respondents reported postponing or not using health care in the previous year because of prior experiences of mistreatment in health care settings. Additionally, much of the community carries with us the trauma of the early years of the AIDS crisis, when the American government and much of the American healthcare system ignored — or was even overtly hostile to — a community in the midst of a devastating crisis of health. Not exactly a condition conducive to trust. It would take the systematic dismantling of entrenched societal, institutional and familial homophobia, biphobia and transphobia in order to completely address the health disparities that the LGBT community faces, which I suppose is a bit of a tall order for a Friday afternoon. So the Association of American Medical Colleges' report earlier this month urging integration of culturally competent LGBT health care across the med school curriculum is a great start. What if providers asked every patient if they had a preferred gender pronoun, or if they had a name a rather than the one on the insurance card that they'd prefer to go by? Even if the guidelines are universally adopted it will be years before we'll see their impact on practice, but some of the simple yet important changes the report is championing could easily be put to work today. There is no such thing as a lesbian knee, or a lesbian armpit or a lesbian neck — at least I've never dated one — but each human being comes to health care with a context and a story, and they both are vitally important. And even beyond being inclusive, isn't "Who do you have to support you?" a much more relevant question in health care than asking what kind of romantic partnership a patient is involved in? When the uninformed wonder why LGBT people need "special health care" with lines such as "Is there such a thing as a lesbian knee? ", they've misunderstood not so much the LGBT community but the nature of health care. Kelli Dunham is a nurse, stand-up comic, LGBT health advocate and author of five books, including the recent tragicomic collection Freak of Nurture (Topside Press, 2013).